Snakes all its appearance, show its independence. They are able to live in the wild without human intervention. Cold, independent animals, despite all the horror that they inspire in people, in fact, considered one of the most beautiful creations of nature. 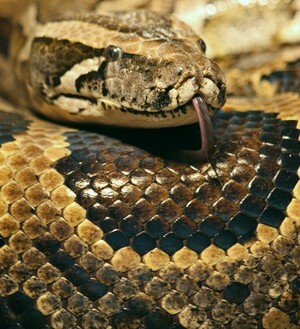 Among snakes there are truly giants such as Anaconda or Python. Python long ago won the love of a man, willing to keep the house, circus artists often use this type of snakes in their rooms, leading adults and children in delight. Fans of snakes love reptile for non-confrontational disposition, and minimal aggressiveness. But do not forget that Python is primarily a predator, it is necessary to behave very carefully. This breed of snakes is most common in Asia, especially in the South-East, in countries such as Burma, Thailand, Indonesia, Vietnam. 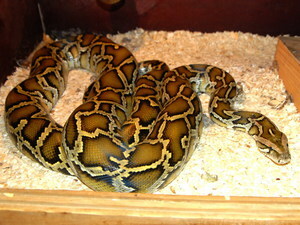 In captivity, pythons long been grown in captivity, especially in Europe and the United States. Reptiles living in the wild, their natural environment, are considered endangered species and are protected by the Convention on international trade in endangered of extinction species. Some time ago, these reptiles were massively exterminated for the sake of the skin, which went to sewing accessories, such as Trouser belts, and shoes. The young brood were killed for the production of blood and bile, widely used as a rare ingredient for the manufacture of medicines. For keeping Python in your home experts recommend to buy individual, born and raised in captivity. As mentioned earlier, fans often buy exotics tiger Python as a pet.They are not afraid of that giant snake size requires special maintenance and attention. This species of reptiles is called tiger, because this tiger snake and something similar color. Habitat is also sometimes coincide. Dvuhnitochnyj dark tiger Python is very different from the rest of their brethren the color of the skins. On the General background of dark tiger Python is darker, the color of the body most often brown. There are spots with reddish, the spots are irregularly scattered on the body and they are all different sizes. Can grow to 8 m, are very harsh and wayward snake. The indigenous population of South Asia is often kept dark tiger Python as a cat, reptile preys on rodents, thereby greatly facilitating the lives of their owners. In Asia, these animals are not only accessories, but also in food. The meat of a Python is considered easy and delicious, the indigenous population came up many national dishes of meat Python. In the wild dark tiger Python chooses to stay damp areas of forests, places near water bodies and swamps, love the water and swim well. Young dark tiger Python is able to climb trees, they do it with pleasure, but with age, including in this way the pythons cease. Indian Python lives for about 20-25 years. Most often found in the wild, like cliffs and water. This reptile in the daytime usually swims in the pond, loves the trees. It hunts mainly at night, as the victim chooses animals the size of a cat, although able to catch something larger, for example, wild boar. This reptile has a light brown color or a light grey shade, with white trim scattered throughout the body. The head is elongated, has an arrow shape, slightly flattened. The skin of this reptile is actively tailoring wallets, shoes, belts. And some people believe this kind of healing, many parts of the body are considered healing, so they destroy it for the sake of manufacturing medicines. Fully to conceive these snakes are ready at the age of 3-4 years. Mating season in this species of snakes lasts about 4 months, at this time they do not able to consume food and not to hunt. Tiger Python albino is considered a rather large snake, which belongs to the subspecies of pythons. Quite common in parts of South and South-East Asia. For this kind of reptiles preferred the marshy areas next to water bodies, overgrown with bushes. 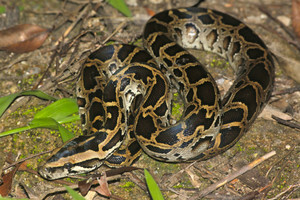 The pattern on the skin of a Python is considered to be a unique, bright-yellow spots framed by white edges. The head and the beginning of the body more vivid colors, closer to the tail the colour becomes paler. Albinos can achieve growth of about 8 m, depending on habitat and food. Unfortunately, because of its rare color this snake rarely live to old age. In the wild it is very noticeable and often falls prey to his enemies. Python albino reptile is very expensive, the minimum cost is 15 000 $. 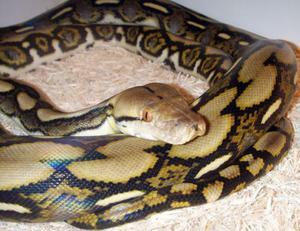 Lovers of exotics are willing to pay for the possession of a rare form of a snake. First and foremost, before such a responsible step, like buying an exotic animal, you need to build him a dwelling. It must be remembered that housing should be comfortable, and most importantly, securely save pet from escaping. The size of the home should be as comfortable as possible for Python, in Python it needs to move. Huge terrariums experts do not suggest, as they are problematic to maintain the desired temperature and humidity. Almost all the time these reptiles spend on the ground, so the height is not as important as, for example, the area of the home. The dwelling must be equipped with a door to in case the pet could get out. But the door must have constipation, this will help to protect pet from escaping. Ventilation should be necessary, the flow of fresh air to any living creature is required. Usually this problem is easy to solve small holes on the sides of the terrarium. The most appropriate materials for making a home for snakes are considered to be wood, durable plastic or glass. This is the most convenient materials, they are easy to clean and disinfect. Temperature is also important. The preferred temperature of the pythons consider 27 degrees Celsius. At night you can do a little cooler normal. To ensure the desired heat level, you can use special support tools that are sold in pet store: heating pads, heating tape, and lamps. The feeding process is quite simple. Reptile can not have a few days, if the owner will not be able to feed your pet, nothing bad will happen. Hunger level is regulated by special touch sensors, which greatly simplifies its maintenance. The adults feed so-called prey. In the role of objects there may be rodents, such as mice. Much debate occurs over whether living or dead prey to feed the Python. Some breeders believe that a live rodent can inflict injuries to reptiles, therefore, before feeding the object outbreaks were sacrificed. But do not forget that in the natural environment, the snake eats the victim alive. As they grow, one object of the snake will be small. There will come a time when reptiles have to be fed to multiple targets at once. So the experts recommend replacing the mice of small size rabbits. Python is an exotic pet, so be sure to consult with a specialist before buying. And be sure to decide for yourself whether the owner to the fact that these snakes grow up to 7-9 m.